Until the switchover to the Giorgio platform, FCA plans to freshen the Challenger, Charge and 300 for the 2018 model year. Fiat Chrysler will refresh and stick with its stable of large cars until at least 2020, two sources told Automotive News. The Dodge Challenger coupe and Dodge Charger and Chrysler 300 sedans, all of which are built in Brampton, Ont., won’t be redesigned onto the automaker’s new Giorgio platform until the 2021 model year, when FCA is likely to discontinue production of one of the large sedans, according to one internal FCA source and one at an FCA supplier. Information from those sources confirms vague details released in a contract highlighter sent to union members that explained the company’s new four-year labor contract with the Canadian auto workers union Unifor. The agreement, ratified by Unifor members last month, calls for FCA to invest $325 million in the Brampton plant to rebuild its antiquated paint shop. Construction is to begin in the summer of 2017, according to a contract highlighter sent to Unifor members from union President Jerry Dias. The Giorgio platform underpins the new Alfa Romeo Giulia, which is due to go on sale in North America by the end of the year. The Giorgio platform would be stretched and likely widened for use by Dodge in North America for a next-generation Charger and Challenger. It is also rigid enough to allow FCA to potentially return to the convertible market for the first time since it cancelled the Chrysler 200 Convertible in 2014. At the most recent FCA dealer’s show in Las Vegas in August 2015, FCA showed a potential future convertible Dodge that it called the Barracuda — a name borrowed from Plymouth’s muscle car past. Until the switchover to the Giorgio platform, FCA plans to freshen the Charger, Challenger and 300 for the 2018 model year. The three large rear-wheel-drive and all-wheel-drive cars were last updated for the 2015 model year, but Dodge has wrung further sales out of its two offerings with a continued emphasis on specialty trim levels. 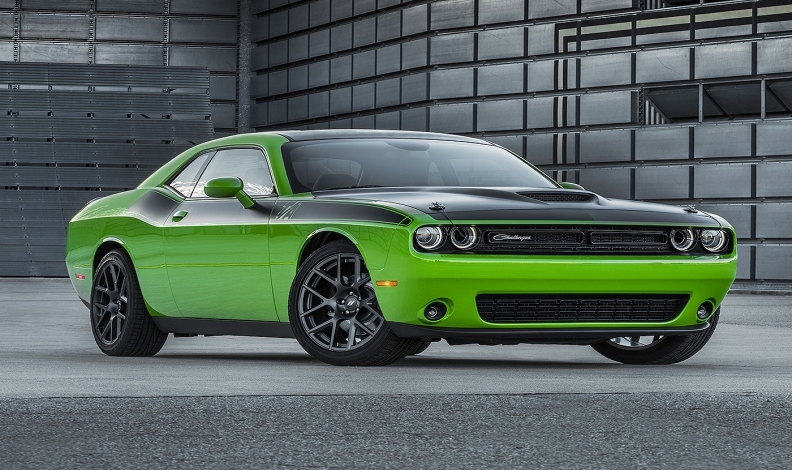 For example, for the 2017 model year, Dodge is returning its T/A name to the Challenger for the first time in 46 years, offering three new subtrims that tack new performance parts and appearance upgrades onto the R/T trim lineup. However, when FCA begins manufacturing the Giorgio-based Dodge cars, it could mean the end of the line for the Chrysler 300 sedan. Since taking over Chrysler after its 2009 bankruptcy, FCA’s executive leadership has consistently eliminated the badge-engineered twinned vehicles that were so common under former owner Daimler AG. Most recently, that has played out with the Jeep Compass, which will replace both the current model Compass and Jeep Patriot when it goes on sale in North America early next year.